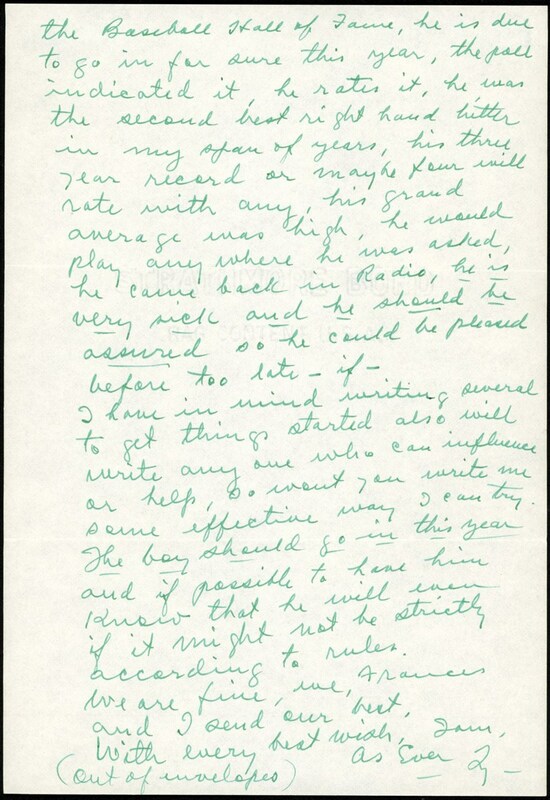 This extraordinary Ty Cobb 2-page letter dated "5/24/51" was written on his personal stationary, and includes extensive content relating to Harry Heilmann's Hall of Fame induction status. 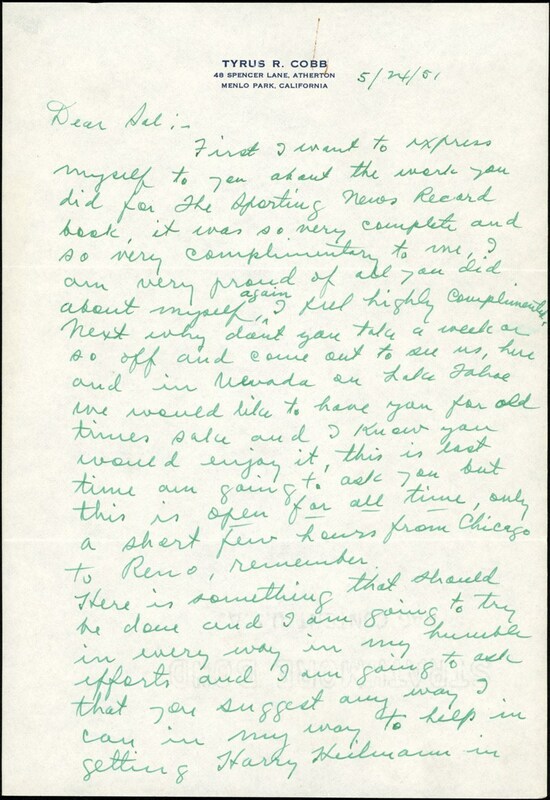 Written in Cobb's typical green ink, Tyrus has written this letter to a distinguished member of the Sporting News Record Book staff, graciously thanking him for a comprehensive article relating to the exalted Georgia Peach. Cobb also extends a strong invitation for him to visit Cobb at his Lake Tahoe Reno, Nevada home, mentioning it is only a short trip from Chicago. Most significant, however, is Cobb ultimately leading to a discussion regarding his dear friend and ex-teammate Harry Heilmann, and how Heilamann strongly merits an induction into baseball's Hall of Fame. Cobb mentions that Heilmann is the second greatest right-handed hitter he ever saw (we assume second behind Hornsby although Cobb doesn't actually state his #1 pick), and easily earned the right to be a Cooperstown inductee. No one would argue with Cobb's point of view since Heilmann ending his career with a sensational .342 batting average, four batting titles including a remarkable .403 average in 1923, and three other times eclipsing the .390 mark! 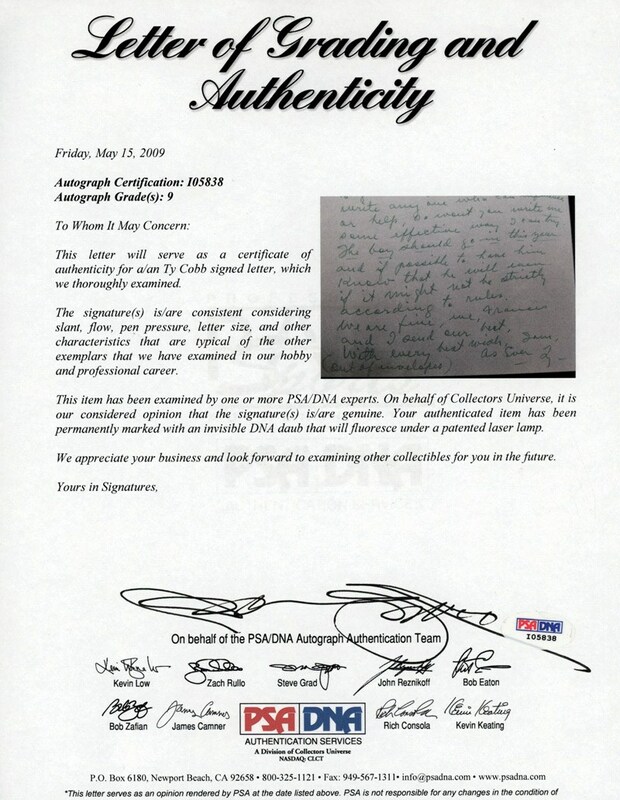 Cobb is basically pleading with his Sporting News companion to make a public "push" advocating Heilmann's quick HOF induction due to his current bout with lung cancer. In so many words, Cobb notes that Heilmann should be aware of his induction before he passes on, for his ailing friend was certainly on "borrowed time" in May 1951.